Is this a religious rite? Sharing papal water glass? Brady is pro-choice and voted against President Bush’s restrictions on funding to family planning groups in 2001. Over the years, he has supported minors’ abortion rights, voting in 2005 for the right for those under 18 years of age to obtain abortions across state lines without parental consent. He voted against the Stupak-Pitts Amendment, which prohibits health insurance companies from offering abortion coverage in a plan to any citizen. He opposed a proposal to prohibit federally funded abortion services. Over the past fifteen years, organizations such as the National Association for the Repeal of Abortion Laws (NARAL), the National Family Planning & Reproductive Health Association, and Planned Parenthood rated him 100%. Sure not the voting record of a "devout Catholic" who follows Church teaching. But in Democrat circles this is exactly what a "devout Catholic" is. Who else is in the "devout Catholic" peanut gallery? Jim Moran, Nancy Pelosi, John Kerry, Joe Biden...all rabid pro-aborts. What does it say when all these "devout Catholics" are in love with a pope? Odd to say the least. What did Jesus say about what would happen to His followers. On the road to Calvary he asked the weeping women, "If they do this in the green wood, what will they do in the dry?" Does any serious Catholic believe we are NOT in the dry wood? So what gives with this papal adulation by those who hate what the Church teaches, but profess to be "devout" members? I'm praying for the pope and the magisterium and studying the faith. We are living in troubling times and many who are not well-grounded on the rock of the faith are likely to be lost in the storm of confusion battering the Church. Remember John Bosco's dream and anchor yourself to the pillars of the Eucharist and devotion to the Blessed Mother. I fear this Pope is also "devout' as defined by the media or holy office of the secular inquisition. Right you are Mary Ann, place yourselves under the Mantle of Our Blessed Mother, pray the Rosary daily, preferably with your family, Mass, Confession, Devotions, Sacrifice and perform the duties to your state of life as best you can and in as much accordance to the Will of God as possible, and be a sign of Hope to others, and we should be ok. Not that the storm will be a picnic, but we should be ok, the Blessed Mother will guide her children. The STORM is now upon us and it will get worse, but TRUST IN JESUS FULLY AND COMPLETELY. I hear daily the words of John Paul ll........BE NOT AFRAID! He knew full well the Storm we were headed into. Yes, that was a really weird thing to do no matter how much one likes the pope, but this man goes against the Holy Father's teachings on abortion, so that makes it exceptionally strange. Maybe taking sacrilegious Communions has affected his brain -- like a few others. These people definitely need our prayers. I know I'm late to the party in submitting a comment on this post (Sept.28) but......Just recently read on another site that Fr. Rossica of 'Salt and Light' claims that the Pope 'healed him'. He doesn't explain from what he has been healed, but this is getting rather scary. First thing that came to mind upon reading about Fr. 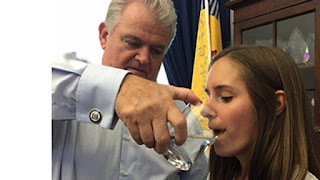 Rossica and coupled with the disturbing Congressman that thought the Pope's drinking glass contained 'Holy Water' was Matthew 24:24.....'For there shall arise false Christs and false prophets, and shall shew great signs and wonders, insomuch as to deceive if possible even the elect.' OnePeterFive also alluded a while back about some (I believe) little girl who was supposedly healed by Francis. I PRAY we don't hear of any more of these so called 'miracles'. Very ominous I must say.